Happy Wednesday! Wow, we’re half way through the week – got to love the short week after a holiday weekend. I’m so excited to get to share this card with you today. I’m finally getting into the fall holiday groove (I’m a little late based on my crafty friends who have been making Halloween, Thanksgiving and Christmas cards since July). That’s ok – my holiday craftiness may be late to the party, but we’re starting it off with a Dare 2B Artzy bang! This card combines two of my favorite things Halloween and shoes! Whoo-hoo! 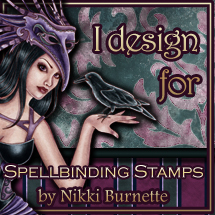 Leave it to Dare 2B Artzy to combine the two into this adorable stamp set called Witches Shoes. I can’t tell you how much I love this set. I was super excited to have received it. The set features 2 sentiments and 6 image stamps. I started off by coloring the large funky witches shoe from the set, combining all of my favorite Halloween colors. I was actually thinking as I was coloring, I’d totally rock a pair of these, LOL! It is so fun with all of the zentangle design in it. Next, I colored the broom from the set too. I kept it somewhat neutral since it’s all about the shoes. I fussy cut both the shoe and the broom out. Once I’d finished cutting out my images, I went through my Halloween paper stash and found a cute piece of cardstock that had orange and black bats all over it. It was a bit busy so to tone it down a bit, I cut a large rectangular spider web. Initially I was only going to use a green spider web, but it turned out to be pretty bright. To tone it down, I die cut a second spider web using some black cardstock and layered them a bit offset from each other to create an interesting background. I think the bright green in the spider web also makes the green I used on the shoe pop a bit more. Because my entire background was a spider web, I couldn’t really layer my shoe and broom directly on top without them getting lost in the background. To break things up a bit, I cut another piece of orange and black polka dot cardstock at a wonky angle and added some little die cut x borders to it. I layered that over the top of my spider web and placed my shoe and broomstick at an angle on the orange panel using some dimensional foam to make them stand out a bit. I added a layer of newsprint cardstock to my back panel and glued all the layers together. I wanted to put all of my layers onto some purple cardstock, but I didn’t have any more in my stash, so I faked it. I cut and scored my card base from some white cardstock and simply sponged on some purple ink around the edges to make the card base on the front appear to be purple. It’s an easy fix in a pinch when you don’t have the right color paper. To add my sentiment, I stamped the Good Witch/Bad Witch sentiment in purple and put some clear embossing powder over it and heat set it. I sponged on a little bit of orange ink to tone down the white cardstock my sentiment was on. Once I was finished I die cut the image, brushed some Spectrum Noir sparkle pen in Amethyst around the edges and added some dimensional foam (a double layer) to the back and placed it off to the side on the front of my card. I added the little green clothespin with the owl. I love this sentiment and the little owl looks so serious, but he’s cute none the less. I thought that my spider web background needed a guest so I decided to add the little spider from the Witches Shoes stamp set. I totally hate spiders so I decided to make him purple because somehow purple spiders are less creepy – right?! I stamped the spider a couple of times using my MISTI and then I used some clear embossing powder on him and heat set it as well. I fussy cut him out and put a piece of dimensional foam on him and placed him in the web. Finally, I added a few purple sequins to give it some sparkle in a few places. I also added some Spectrum Noir sparkle pens on a couple of places on the shoe and the boom, but they don’t show up very well in the pictures. All in all, I really love this card. I think I enjoy creating cards for Halloween more than any other holiday. They’re always so much fun to make and it usually involves my favorite colors. The sky is the limit when it comes to creativity with this new Dare 2B Artzy stamp set, Witches Shoes. You could even use the MISTI and a mirror image stamp (or back of a large square stamp would also work) and mirror stamp the shoe and make it a matching pair of rockin’ witches shoes – how cool would that be? Personally, I’m thinking someone needs to invent some zentangle witches shoes in real life because they would be so much fun to color and decorate. Anyway, hope you all enjoyed my card today! Have a great week & spend some time getting crafty! ← Dare 2B Artzy September Challenge!